The decision to install a custom wooden garage door will add a unique aesthetic appeal to your house given that it can be built to follow the current design of your home. Wood adds a beautiful, natural look to any property, but it does come at the expense of extra maintenance. The professionals at Colorado Overhead Door Company have taken the time to help you breakdown the advantages and disadvantages of having a custom wooden door installed over the more traditional metal doors found on most homes. Whenever you decide to go ‘custom’ you give yourself the option to dictate all aspects of the overall design. From the size to the color, the buyer can meet with a designer to build a garage that best fits their personal needs. Not all land was created equal, and residents of Colorado’s Front Range region know that all land is not level. Custom doors can be constructed to meet the requirements of any lay of land. Wooden doors can be designed to match the look and style of your home. The experts at COHDCO can help you select a design that complements you home. 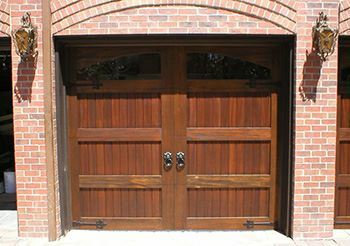 Wood itself has many advantages, as it does not crack or dent like the standard aluminum doors on the market. Wood is both eco friendly, and it allows for repairs to be made only to the damaged section, where a damaged aluminum door might require that the full door be replaced. Not only is wood proven to withstand all sorts of humidity and climate changes, but it also allows for easy repainting. This will extend the life of your garage door and gives you the chance to quickly update the door’s appearance with a fresh coat of paint. Wooden doors are now designed to open both electronically and manually, so once balanced the door should open with the same ease of its metal counterparts. Given the fact that they are custom built, they do cost more than the traditional garage door. Wood does absorb water, and this leads to rotting. While routine maintenance can prevent this, it can be a difficult problem to fight once it has begun. Custom design also requires a bit more time, meaning that it could take longer to install. Heavier doors require larger springs, which can be harder to come by when repairs are needed. Fortunately, the maintenance crew at Colorado Overhear Door Company have these parts in stock. A quick look at our Garage Door Maintenance Guide should help you extend the life of both your springs and your door. When it comes time to decide which product you want to go with you must be sure to focus on what your needs are. If you are requiring a door that stylistically follows the architecture of your home, a wooden door might be the best option. If you are after an option at a lower cost and one that requires lower maintenance then going with a different material might be your best option. Either way, we are here to help you weigh your options and make the best decision. Give us a call for a free quote on both our custom wooden doors and our residential doors, and the crew at Colorado Over Head Doors Co. will be more than happy to help you decide which garage door best meets your needs.